Following on from my previous Brain Work blog post about Facebook Insights, for this post I would like to share my recent experiences of utilising paid Facebook advertising for our library’s Facebook page. Page Likes: An advert shown to our specified target audience to invite them to like our page. Boosted Posts: Promote a single post from our Page to help it reach both our existing fans and people who have not ‘Liked’ our Page. This is the second semester in which we have utilised paid Facebook adverts, which means I have been able to learn from the first semester and make adjustments for the second. For this post, I would like to reflect on choosing the right type of metric to be able to accurately assess the performance of your advert. 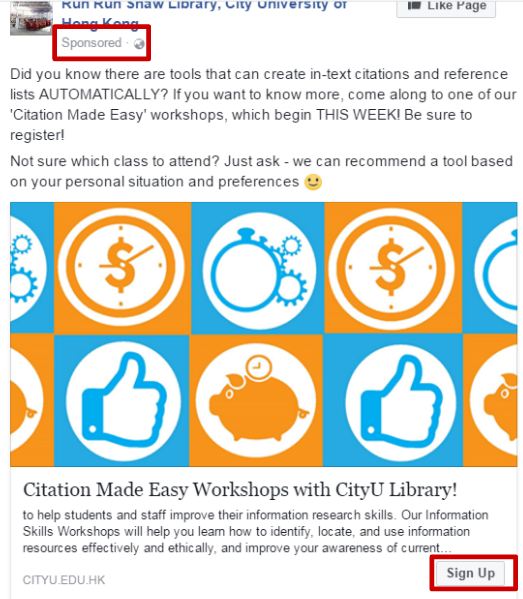 In the first semester of experimenting with Facebook advertisements, we boosted a post promoting our citation management workshops (Fig 1). In my previous experience, I had found Photo posts had performed better on Facebook than Link posts, so I used the same strategy in this advert. Fig 1: The first advert promoting our citation management workshops, run in November 2016. The results of this post were both encouraging and disappointing. While I was pleased that 54 people ‘reacted’ to the post, only 6 people clicked the link to view the workshop registration page. This indicated to me that people liked the content of the post (perhaps baited by a cute kitten! ), but they were not so engaged as to take the extra step to click the link and view the workshop registration page. To address this, in the second semester I used an advert type specifically designed to direct people to a destination off Facebook. The major difference is the ‘Sign Up’ button at the bottom of the post (Fig 2. ), which when clicked directs users to the workshops registration page. Fig 2: The second advert promoting our citation management workshops, run in February 2017. 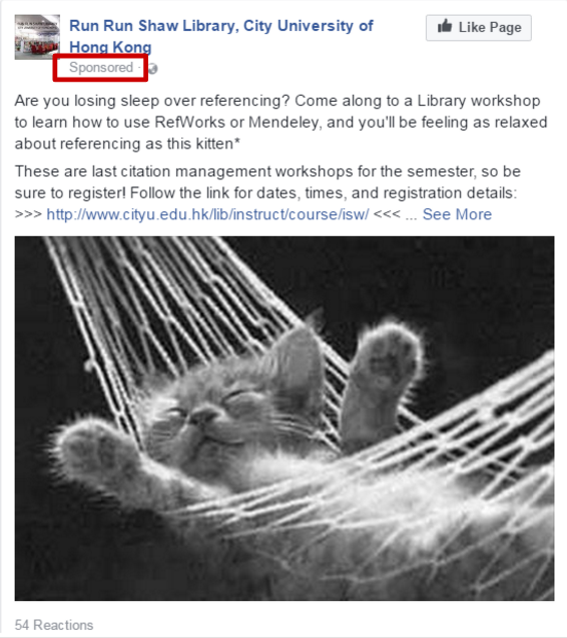 The performance of this advert was much more encouraging: while only 6 people ‘reacted’ to the post, 93 people clicked the link to visit the registration page – a number greatly improved from the previous semester. Ordinarily the low number of reactions to a paid advert would be disappointing, but in this case, a high-click through result is preferable to lots of Likes. In terms of the impact on workshop registrations, we did record a slight increase in the number of registrations and attendees, but certainly not an increase of 93 people, meaning not all of those visitors to the registration page actually registered for or attended the workshop. This could be a reflection of the design of the workshop registration page or the process of registration. This brings us to the next (much larger!) phase in our assessment of our Facebook adverts – to investigate their real-world impact outside of link clicks and post likes. While Facebook is notoriously secretive of about how their algorithms work, they do provide a huge amount of data to demonstrate how your content is performing – and paid adverts are no different. Ultimately this exercise taught me to pay attention to the metrics used to assess the performance of Facebook adverts, and to choose an advert template that addresses the goal of placing the advert. This whole exercise forms part of a broader strategy in the Library to adopt an evidence-based approach to the use of Facebook to ensure our efforts on social media are worth the time investment. Based on the increased outreach and engagement with our posts thanks to paid advertising, our Library will continue to experiment with Facebook adverts in the coming academic year.